RPS Duct Mounting Pedestals are the ultimate solution to mounting duct runs across a flat or pitched roof. 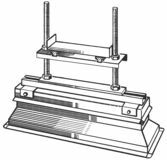 Each RPS duct mounting pedestal incorporates an RPS Equipment Rail to assure proper support and a superior flashing base for securing the roofing termination. On top of the equipment rail, the duct slide assembly allows for duct movement due to expansion and contraction while assuring that the ductwork can be secured to the support. 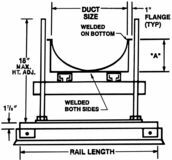 Additionally, the duct slide assembly allows for 12" vertical and horizontal adjustments to mount ductwork level and straight. Each duct mounting pedestal has a full line of features which allows for single to multi-duct mounting with a minimum of effort and a maximum of speed. Automatically travels with vertical duct adjustment. Allows installer to lay ductwork in a cradle and secure it at each support. All Sizes: Accommodates rectangular ductwork and round ductwork up to 84" wide (heavy duty, larger size assemblies also available- call RPS). Longer equipment rails and slide channels, double slide channels, and multi-duct assembly combinations available to provide multi-duct mounting side-by-side and/or piggy-back on a single equipment rail.